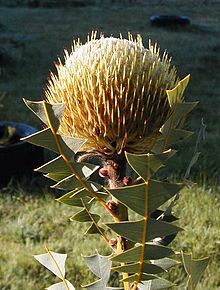 The Baxter's banksia (Banksia baxteri), also known as bird's nest banksia, is a species of shrub in the plant genus Banksia. It occurs along the south coast of Western Australia between Albany and Esperance. B. baxteri in cultivation, Colac, Victoria. A 1980 field study at Cheyne Beach showed it to be pollinated by the New Holland honeyeater and white-cheeked honeyeater. Banksia baxteri is serotinous, that is, it has an aerial seed bank in its canopy in the form of the follicles of the old flower spikes. These are opened with fire and release seed in large numbers, which germinate and grow after rain. Seed can last for many years; old spikes 9 to 12 years old have been found to have seed that remains 100% viable. Seeds do not require any treatment, and take 21 to 42 days to germinate. ^ Hopper, Stephen D. (1980). "Bird and Mammal Pollen Vectors in Banksia Communities at Cheyne Beach, Western Australia". Australian Journal of Botany. 28 (1): 61–75. doi:10.1071/BT9800061. ^ Lamont, Byron B.; Le Maitre, D. C.; Cowling, R. M.; Enright, N. J. (1991). "Canopy seed storage in woody plants". The Botanical Review. 57 (4): 277–317. doi:10.1007/BF02858770. ^ Sweedman, Luke; Merritt, David (2006). Australian seeds: a guide to their collection, identification and biology. CSIRO Publishing. p. 202. ISBN 0-643-09298-6. George, Alex S. (1981). "The Genus Banksia L.f. (Proteaceae)". Nuytsia. 3 (3): 239–473. George, Alex (1999). "Banksia". In Wilson, Annette (ed.). Flora of Australia: Volume 17B: Proteaceae 3: Hakea to Dryandra. CSIRO Publishing / Australian Biological Resources Study. pp. 175–251. ISBN 0-643-06454-0. "Banksia baxteri R.Br". Flora of Australia Online. Department of the Environment and Heritage, Australian Government. "Banksia baxteri R.Br". FloraBase. Western Australian Government Department of Parks and Wildlife. "Banksia baxteri R.Br". Australian Plant Name Index (APNI), IBIS database. Centre for Plant Biodiversity Research, Australian Government. This Banksia-related article is a stub. You can help Wikipedia by expanding it.